Rehabilitation is also recommended to help your pet return to his/her normal self. “Rehab” promotes a more rapid return to normal function by maintaining normal range of motion in the joints, by maintaining or increasing muscle development, and by improving balance and co-ordination. The Rehab program outlined below has been developed specifically for your pets post surgical recovery period. Rehab will help speed up recovery and increase the likelihood of an excellent outcome. It is very important that for you to contact the if you have any concerns regarding the program or exercises outlined below. It is also extremely important that these exercises are performed in a manner that is not painful for your dog or dangerous for you to perform. Never force any therapy. If your pet seems excessively painful during any of the exercises please stop them and contact the hospital for further instructions. Figure Eights To perform this exercise effectively, imagine a large figure 8 on the ground with each circle approximately 10 to 15 feet in diameter (if your dog is having difficulty navigating enlarge the size of the figure 8). Walk your dog around the figure 8 at a very slow speed. This exercise should be performed 3 to 4 times daily and each session consists of ten repetitions. As your dog becomes more adept at performing this exercise the size of the circles can be decreased to 4 to 5 feet in diameter. Continue with moist heat after the above activities. Continue with massage and PROM exercises if needed or found to be beneficial. Otherwise discontinue. Increase walks to 15-20 minute leash walks 3 times daily. Increase walks to 20-30 minute leash walks 3 times daily. (if possible in an area where short hills are present- see “Slow Controlled Hill Walks” below. Continue with Sit-Stand-Sit exercises. Should be increased to ten to twenty repetitions 3 to 4 times daily. Continue witNovember 21, 2018h Figure Eights. Increase to ten to twenty repetitions 3 to 4 times daily. Controlled stairs, (i.e.- holding your pet’s collar) may be performed at this time if your pet seems up to it. There should be no free access to stairs until permission has been given- typically at the 8 week recheck. Do 5 to 15 stairs (typically one flight) in a row 1 to 3 times daily. If stairs are not present in your home you may take your dog to an outdoor area where stairs are present or just skip this exercise. Slow Controlled Hill Walks. Use a hill that you can comfortably walk on (not too steep). 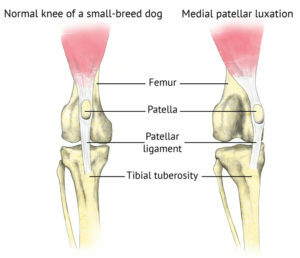 This exercise involves walking your dog SLOWLY up, down and across the hill with the surgery leg on the down-slope side while on a short (2 to 3 foot) leash. This exercise increases strength and muscle mass of the surgery leg, promotes better balance and improves the range of motion of the knee joint. This exercise should be reserved for after his/her leash walk since your pet will typically be a little calmer and more manageable at this time. If all is going well at the eight week recheck exercise restrictions are typically lifted with the exception of high impact activities involving ball and frisbee play, rough-housing with other dogs and off leash activities outside of the backyard. Typically all restrictions are lifted by 10 to 12 weeks post surgery. Thank you for allowing us to share in the treatment of your dear family member.